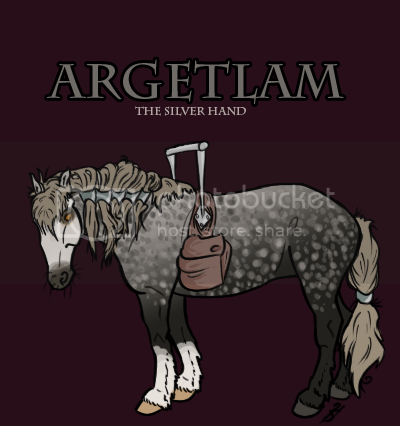 The thick body of a Shire strung with a dapple gray coat is the embodiment of Argetlam. He has his finer points however, such as kind amber eyes, a straw-like mane and tail, in both texture and color, and a pale white face that is copied on his front limbs in knee-length socks. He is not an all together handsome stallion; there may have once been potential, but he does not shine under the sunlight - he is often too dusty and smeared with soot. He does not have perfect hair - it is usually in various lengths, either from being pulled out or burned off, usually knotted and mussied with a stiff feel. Neither does he have a cool tongue - too often he fumbles under words or lets slip awkward pauses. There are a few instances where Argetlam has crafted things for himself. Such as a barrette of metal, in which he has his dragon thread his mane into so it'd stay out of his face. Also a clasp against his tail, to keep it more together so it wouldn't tickle in-between his legs. Most noteworthy however, is the branch of metal rising from his withers. Using cured deer hide to fashion a sling with pouches on each end to store metal ores, there's also an affixed perch of iron for his dragon to land upon. After getting one too many scars from the dragon trying to land on his back, he crafted the metal perch for the dragon instead. Coat: dapple gray, dark muzzle. Lots of sooty and dirty patches. Other: metal barrette for his mane, metal ring on his tail, horse shoes on hooves and metal perch on shoulders for dragon with cloth bags over withers to store things. The gentle giant. Argetlam is a very peaceful horse with a kind soul and good intentions. Even when faced with attack, he will stand down and refuse to lift a hoof in violence. Luckily his hulking body can usually handle this abuse. He will never fight back. In his travels he has often been coveted for his ability, or his size. He would be the ideal war machine - built to trample foes and craft weapons for the frailer warriors. Unfortunately everyone always seems to forget that you cannot make a warrior's heart or mind the way you can train a weak body to be fit. Argetlam just doesn't have the ability to injure purposefully, and would likely crumble if truly forced to attack another. It's why he's traveled so far and so long, searching for a place he can be accepted freely. Argetlam would love to do nothing more but explore the landscape, gathering the precious metals and ores from the soil. Far from being a selfish or isolated creature however, he seeks the company of others. Feeling inadequate for refusing to fight, Argetlam hopes to make amends with everyone, by offering gifts in excess. He takes his metals and crafts them into fantastic sculptures, intricate wear for the body either in jewelry or armor, and even, as weapons. Though he struggles with the creation of war items with his ability, he feels that he can help protect someone with the weapon, and make them happy with that so they won't force him to stand on the front lines beside them. Truly though, Argetlam would just give his artwork away, because then it won't harm anyone, but still makes them happy. His true gift comes in the application of his craft with his ideas. Argetlam is not the brightest individual out there, but he has an eye for how things work and likes to dream big. He's often experimenting things on himself, hoping to find useful tools that may change the life of someone, or perhaps the world. Ideally, he'll invent something to stop war all together, but he isn't quite sure what that will be yet. So for now, he's content to practice putting metal on the bottom of his hooves to keep them stronger, or a braid of metal in his mane to keep it out of his face. In getting a dragon, Argetlam will become even more successful. Dragon fire will strengthen and temper the metals in new ways, and with an extra set of claws and beak to help him, designs can become even more intricate. The use of animal hide in conjunction with metal is an even greater break through. Unable to catch, much less skin prey before (not that he ever would have killed innocent animals anyway), the dragon allows a supply of hide that can help cushion, tie or thread metal parts. Born in the lands of Alacridata to the metal family, the young colt's life was due to be wealthy and prosperous. From a very young age he showed aptitude for his craft, but it wasn't until weaning that it became known he could manipulate all types of metal. Argetlam was no ordinary blacksmith, he was a Metal Cre. His direct family was over joyed and much celebration was to be had in the entirety of his metal family. Flushed with all the excitement the humble colt became ever more shy. It was found cute for a while, but eventually he had roles to fulfill and expectations to meet. He always struggled with forming perfectly to their mold, especially when they asked of him to make weapons. Such armory was the main source of a metal crafters design, but Argetlam had always been more fond of jewelry and trinkets. He had an especially inventive mind, watching with great excitement what things the Makers could produce. He like to make intricate designs, ideas and even small machines, though he had no ability to give them life. This did not sit well with his family. Eventually it came down to do or die so Argetlam fled all he had ever known. Though fear beat in his heart and worry tugged in his mind he managed to escape alive, surely unable to return. He thinks of his family at times and still says their name proudly, as they were his childhood and the past is often rose tinted. He especially recalls his elder sister, Isdira. She smithed charcoal, useful to the blacksmiths but not reall ideal or powerful. She had a bitter soul and often bullied Argetlam, but he never took her hard words to heart. When he became known as a metal cre her jealousy increased ever more, as did her wickedness, but Argetlam enjoyed what advice she gave him even if it was crooked. In his long travels over the years Argetlam eventually made his way to Isilme. There he wandered into the Moonlit Tides, soon joining their herd as a crafter under Paladin's reign. He refused to make any instruments of war, as always, but was accepted in the rather peaceful if defended territory. At one point the beaches were invaded but Argetlam, unskilled in battle, only tried to be a shield before being knocked out. When he awoke the shades had overrun the land and he had to gallop for his life's sake from the dying realm. World of stone. -- Met by Insanity as he stands at the borders of the Windtossed Foothills. He joins their herd, soon to become a crafter. Unknown history is doomed to repeat -- Arrives to hear Paladin tell a story to Willow, Aaron and Nayati in the Foothills. Of Mice and Men. -- Shuler and Crowley of the Aurora Basin are caught trespassing/spying on the Foothills by Jackal, Argetlam comes to investigate and assist. Fortunate Affairs -- Tries to recruit Avalon in the Threshold alongside Gaucho, Naberius and Nafertari. Avalon chooses to follow Gaucho to the Throat. Her haunting stare -- Tries to recruit Arah in the Threshold alongside Frost Fyre and d'Artagnan. Arah chooses to follow d'Artagnan to the Basin. To Build an Army... -- Approaches Catillatio in the Eastern Lands and warns him of spreading rumors. Leaves afterwards. where? -- Wanders the Foothills in search of ores and meets Nayati and Nadira. Fight. -- Insanity captured Delinne and Argetlam approaches the prisoner to investigate, in the Foothills. Nadira and Aaron arrive as well. green grass -- Argetlam meets Kanti's new companion in the Foothills. Distraction at its Best -- Ailith comes up Argetlam while he's grazing in the Foothills and seeks to join. where oh where -- Comes across Ricochet in the Midland Hills while hiding out some rain. Ricochet seems interested in the Foothills. |winter| -- Travels with Willow, Nadira and Aaron to the Basin to meet with their healer, d'Artagnan. Meets Arah again as she appears, and their lead Mauja. They are denied and driven off. We are The Grey -- Intrudes upon a meeting of The Grey after pursuing Willow and her captors. Aaron is there as well, but both are chased off by Phaedra, Ophelia, Ktulu, Archibald, Apollo, Peixos. Ophelia uses her memory erasing magic on Argetlam. .missing. -- Frantically calls for the herd in the Foothills after seeing Willow being stolen and recognizing Romani had been taken as well. Aaron, Nadira, Ailith and Xanthos of the World's Edge respond. prisons -- Seeks out Delinne after two of the Foothills have been kidnapped. Thinks she might know some information about prisoners. She advises him in return for him explaining she's pregnant. slinking shadows -- Travels with Aaron to the Foothills in search of The Grey, an outcast group which took Willow and Romani from the Foothills. Rafe arrives to provide some insight, but little of it. into the unknown -- Tries to recruit Aelerin in the Threshold, alongside Baldur, whom she decides to follow as an Outcast. With foes ahead, behind us dread -- Jackal summons the Foothills herd to speak of the threat of The Grey. Paladin leaves, not wanting to fight his own daughters, the two leads of The Grey. Nadira, Aaron, Locket, Ailith, Resplendence, Quilyan and Ariadnê respond. let me hear you -- The Grey invades the Foothills and Argetlam stands to defend his home, but having no fighting experience and truly not wanting to, he is knocked out within the first round. *Argetlam should never participate in any fight. if you cannot defeat them, join them. -- He returns to consciousness to see that the Foothills was lost to The Grey. Argetlam seeks out one of the leads, Ophelia, joined by Peixos, to see if he might be able to stay. She tells him truthfully that they will often participate in violence so he chooses to leave. deliverance -- Following the other refugees of the Foothills, Argetlam makes his way to the World's Edge seeking entrance to the herd. He is met by Crven and Aaron. Email: Send Argetlam an email.